Years ago an older friend, when asked to crew aboard a 34-foot boat in an offshore sailboat race, replied that he didn’t sail offshore on any boat that was shorter in overall length than he was years in age and declined the invitation. It seemed a bit silly to me at the time, but I must admit the older I get the more sense it makes. Fact is, it’s tough to beat size when it comes to comfort at sea but some sailors actually prefer smaller boats for offshore passages and consider them safer. In 1983 the late Monk Farnham, a 74-year old former editor of Boating and Rudder magazines, sailed his Shannon 28 Seven Bells across the Atlantic to capture the Guinness World Record as the Oldest Solo Sailor across any ocean. In doing so, Farnham demonstrated the two most important things necessary for safe offshore passages: a capable boat and a capable captain. The owner and founder of Shannon, Walter Schulz, is also the designer of the Shannon 28. Introduced in 1978, more than 50 boats were built between 1978 and 1985. Shannon continued to offer custom-built Shannon 28s until 1999, by which time the cost of a new boat had risen to over $175,000. The Shannon 28 measures 28 feet on deck but has a three-foot bow pulpit and an outboard-hung rudder for an overall length just short of 32 feet. The waterline length is 22’ 11”, beam is 9’ 6”, and draft is 4’ 8”. She displaces 9300 poundswith 3400 pounds of internal lead ballast, and the hull is a full-length keel design, which is slightly cut away aft for more responsive handling and tacking. Walter Schulz once said, “I’d like to have every boat I build…outlive me”, and while I don’t know if all Shannon 28s will outlive Mr. Schulz, it is not likely to be the fault of their construction if they don’t. Shannon 28s were built without compromise for cost. These models were built before Shannon started using vinylester resins and epoxy barrier coats, and boats are quite likely to have some degree of osmotic blistering if remedial measures have not been taken to eliminate it, although I have not seen any cases of severe blistering. The decks were constructed with balsa wood core; however, Shannon uses a great deal of care in attaching deck hardware. As a result, delamination and deterioration resulting from deck leaks are not typical. The hull-to-deck joint is an internal flange bonded with adhesive bedding compound and bolted on 8-inch centers. Structural bulkheads are first attached with fiberglass straps through the bulkhead and then further secured with continuous fiberglass tabbing along the entire joint. These belt and suspenders methods are typical of the entire construction. The 28 is also built with an eye towards the inevitable required maintenance as evidenced by the fact that the three stainless steel water tanks and single aluminum fuel tank are designed to be removable without having to damage any part of the boat or its joiner work. On deck, the Shannon 28 is well-designed from the three-foot bow pulpit that accommodates two anchors, to wide side decks for safe and easy passage, to a comfortable seven-foot long cockpit. But, I believe the most notable feature of the Shannon 28’s decks is a large, diamond-plate nonskid pattern, which provides the most secure deck surface of any boat in this size range. Two cabin arrangements were offered with the most common layout featuring a six and a half-foot-long V-berth forward followed by opposing port and starboard settees in the main saloon with a starboard galley and port head aft. There were several adaptations of the settees but they were typically only about five feet long with foot holes through the forward bulkhead to allow enough space for an adult to lie down. This is not a very comfortable or desirable arrangement for offshore sailing, so an optional “C” for cruising arrangement was offered. This featured a double quarter berth to port and moved the head forward of the main saloon. In either case, interior joiner work is excellent; there are six feet of headroom in the main saloon, and the galley is the best of any 28-foot cruising boat. Auxiliary power is provided by a 15-horsepower, two-cylinder, Yanmar diesel mounted beneath the cockpit deck. This is marginal horsepower for a 9300-pound boat but about all that could be squeezed into the limited space. Access for service through the cockpit locker and beneath the companionway steps is acceptable. 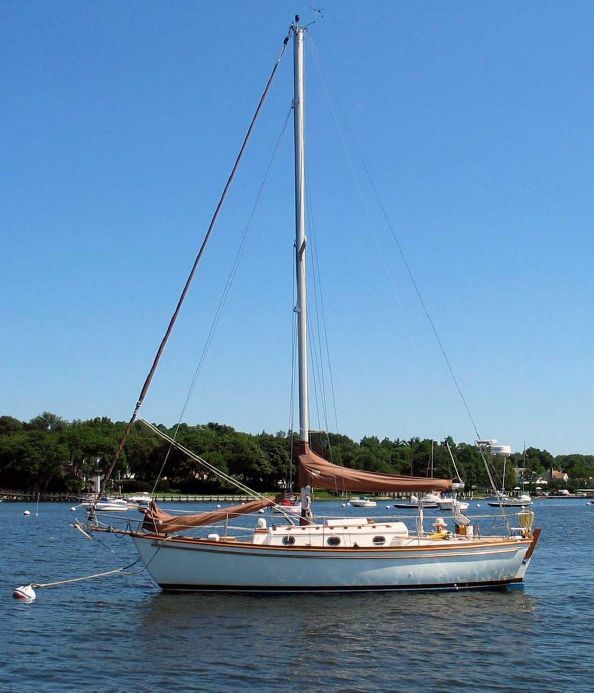 The Shannon 28 is Cutter-rigged with a 470 square-foot sail plan and a sail area/displacement ratio of 17 ensuring at least respectable light air performance. Heavy displacement, full keel boats should not be expected to turn as quickly as lighter fin keel models, but positioning the rudder further aft and cutting away the aft portion of the keel actually makes the Shannon 28 quite maneuverable. One of the advantages of the Cutter rig is that it allows you to maintain a well-balanced sail plan when reducing sail, so when the wind picks up this boat is in her element. Even though there were very few Shannon 28s built, there are usually several available on the used market if buyers are willing to travel a bit. Researching this article in December 2002, I found three boats currently offered for sale: one in Washington state, one in Maine, and one in New York. The asking prices ranged from $59,000 to $69,000. I was able to identify six boats that had been sold within the last year and a half with an average selling price of the six was $52,400. The Shannon 28 is a boat suited for a lifetime of sailing no matter where or when you sail. I believe there are few who would argue the value of these great little yachts.